NEW YORK, NY--(Marketwired - Sep 10, 2015) - MOL Group, an international oil and gas company based in Budapest, Hungary, has begun rolling out a scalable convenience store prototype created in close collaboration between its internal retail group and CBX, the strategic brand agency and retail design consultancy based here. MOL operates a network of more than 1,900 fuel centers in 11 countries across central and southeastern Europe. The first 28 locations under the Fresh Corner brand opened over the course of the past three months in six countries (Hungary, Croatia, Romania, Serbia, Slovakia and the Czech Republic). The initial stores range in size from 500 to 2000 square feet. CBX was tasked with creating a new retailing concept and prototype that would reflect and respect the diversity of the company's distinct national markets. In addition, with its expansion driven by acquisitions, MOL's network currently incorporates a number of different nameplates and footprints. Consequently, part of CBX's assignment was to develop guidelines and criteria to help the company determine which store size and product assortment would be right for particular markets and locations. Finally, CBX worked with MOL to develop a core c-store offering, including hot beverages and food-to-go, that could be applied with modification across all of the company's national markets. Joseph Bona, CBX president of branded environments and a veteran c-store designer, noted that product offerings in MOL's retail facilities were heavily focused on automotive supplies and accessories. To aid the company in developing a true convenience retail assortment, CBX analyzed MOL's sales data to determine the optimal core offering. "We felt the convenience assortment needed to do three things," Bona explained. "First, increase shopping frequency. Second, increase the basket size and third, provide items that people need on a regular basis, not for a roadside emergency. It was really about giving people more reasons to shop at the MOL network and encourage them to buy more when they do." Reflecting on the overall scope of the project, Lars Höglund, SVP MOL Group Retail, commented: "MOL defined a very ambitious retail strategy for the upcoming years. To be successful with our mission, we had to reconsider all aspects of our retail fundamentals step-by-step, and CBX was a great partner and mentor on this journey. The new design was created in order to best support the provision of the renewed offer. The external design communicates immediately that we moved away from the traditional forecourt shop towards a retail outlet where customers can make their daily top-up shopping, as well as buy hot beverages and food for the road." 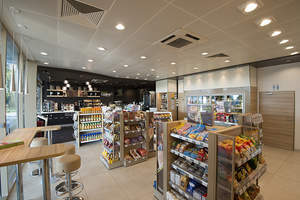 In terms of site design, Bona noted that in many MOL locations, the gas canopies are connected to the stores, which typically has a dramatic influence on customers' perceptions of the facility. "We had to make sure the store's exterior communicated properly what is inside," he said. "To accomplish that, we designed an all-glass storefront that clearly displays the convenience and food offerings inside, and created an outdoor seating area to further reinforce their food offering." Adjacent to the outdoor seating area, the store's exterior sports a newly designed visual identity -- a large graphic of a cup of Fresh Corner-branded coffee. This reinforces the message that food is inside to customers at the curb or gas pumps. Of course, that message is also conveyed through the store's new name, "Fresh Corner." MOL had been employing the "Fresh Corner" descriptor to demarcate a small food area inside its retail facilities, and at CBX's suggestion, this became the stores' main identity, branding them as a food retailer rather than just a gas station. "Since the company owns the name, we took 'Fresh Corner' and applied it to the exterior of the building over the entrance," Bona explained. "Like the effort behind the stores' core offering, the challenge of developing a foodservice offering that could work in the different countries was tackled in a similarly analytical fashion. We started with the belief that 80% of what people expect in terms of food-to-go from a c-store is fairly universal," Bona said. "It's the other 20% where you need to create the flexibility to entertain different taste profiles, flavor preferences and unique items. The system we created allowed for local nuances. But the system of delivering the food, the preparation, the presentation and the packaging, all needed to be consistent." "Our key challenge was to know exactly who our customers are and what they want in the different markets," noted Höglund, who added that MOL has also focused on improving customer experiences at the fuel pumps and other areas. "We had to align ourselves with the latest market and customer trends and convert our filling stations to service stations. We aspire to leap-frog competition not only in our offer, but in operations, too. We are transforming our pump attendants into hosts, who from now on need to think, act and behave with 100%-customer focus." 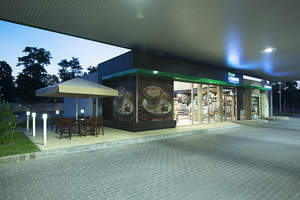 "As a result of our intense, joint efforts," Höglund summed up, "we now provide a relevant customer offer at all of the pilot sites, which includes an enhanced hot beverage and food-to-go program, a new convenience store concept with daily essentials, as well as a renewed car wash offer and other services. Ultimately, we intend to roll out these elements to all locations." MOL Group is an integrated, independent, international oil and gas company, headquartered in Budapest, Hungary. It has operations in over 40 countries and employs almost 29,000 people worldwide. MOL's exploration and production activities are supported by more than 75 years' experience in the hydrocarbon field. At the moment, there are production activities in 8 countries and exploration assets in 13 countries. The Group operates four refineries and two petrochemicals plants, under integrated supply chain management, in Hungary, Slovakia and Croatia. MOL Group also owns a network of over 1,900 service stations service stations across 11 countries in Central & South Eastern Europe. In addition to creating a new look inside and out, CBX worked with MOL to develop a core c-store offering, including hot beverages and food-to-go that could be applied with modification across all of MOL's national markets.